The solo Line Up explores the passage of time as a surface of intensity rather than a linear process of development. 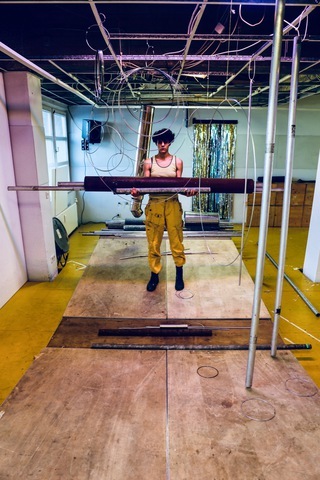 On a stage full of loud metal objects and through a practice of excessive speech, the performer works towards organising elements that she can never fully control. While navigating the chaos of putting things in order, movement and time appear in their bare state, with no beginning or end. Line Up invites the viewer to experience the urgency of a single moment of control and the everlasting loss of it. A production by Lee Méir in collaboration with Vierte Welt and Ausufern. Co-produced by Uferstudios GmbH in the frame of the Project „Life Long Burning“ with the support of the Cultural Program of the European Union. Funded by the Capital Cultural Fonds (Haupstadtkulturfonds). Line Up trailer from lee meir on Vimeo. © Lee Meir 2018. all rights reserved.